Children to succeed in today's world require more than just teacher-led instruction and established-factual knowledge from text books. They need experiences and skills developed through active engagement and exploration of real-world challenges. Most current teaching pedagogy in India witness students in a classroom setting relying on the teacher for knowledge. Opposed to this, in projects - students learn how to take responsibility, initiative, communicate ideas, work in teams and manage themselves to investigate, respond to and solve challenges. Some describe this difference as ‘Knowledge' vs ‘Learning'. Intrigued? Let's look at some of the popular Project Based Learning Schools in India that utilise and tie in their curriculum with the multidisciplinary Project Based Learning (PBL) approach and create a niche for themselves and their students. To help change the standard method of teaching, ASB uses the project based method as an alternative option to the way traditional teaching takes place. This PBL school in Mumbai believes that students perform better when guided by their inner source, and thus their teaching is most effective when they facilitate collaborative student learning through media-rich, interaction and other authentic learning experiences. Students are motivated to take the lead, involve themselves in projects that meet their interests and skills, and then students are assessed on their team work and all-round understanding of their learning. Pathways recognises that individual students have diverse 'intelligences' and thus it is logical to develop individual talent through distinct projects of the student’s interest. Since the projects are students’ own, it ensures that students work with complete concentration which further ensures that learning is long lasting. Primary classes at Pathways are frequently well-organised to function like this. 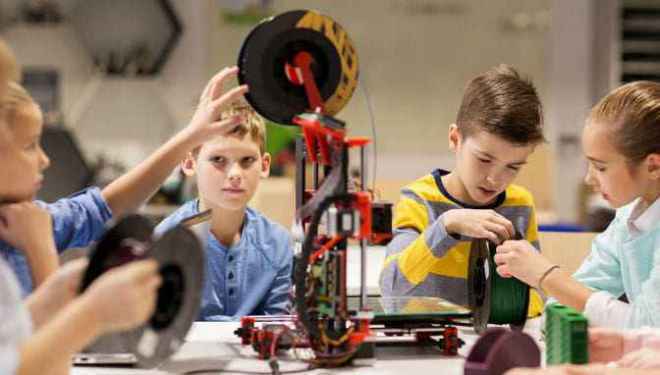 The project based learning method is also applied to the secondary curriculum - for example: a Design-Technology workshop at Pathways shall witness 15 students pursuing 15 different design projects in engineering, in architecture, in electronics, in plastics and many others within the scope of the subject. This innovative Project Based School in Gurgaon is uniquely following the CBSE curriculum using the PBL pedagogy. Their PBL approach takes into consideration aspects of students' interest and creates processes to ensure students benefit from the learning methods by making learning deep and impactful for the long run. Their striking building design and open-plan classrooms give learning space to students to meet the dynamic needs of their projects. As a culmination of each project, students are encouraged to present their findings and learning thus giving them many opportunities to build their communication skills and confidence. This PBL school in Gurgaon focusses on preparing future ready individuals rather than just prepare students for CBSE based exams. Riverside School is an established Project Based Learning school in Ahmedabad with its practices recognised worldwide. It strictly follows a personalised learning model for primary education based on multiple intelligence theory. The main idea behind the learning methodology is instilling the 'I can' mindset in every child to develop a sense of confidence to face the world and its challenges. Riverside has designed and implemented a unique user-centric curriculum which focuses on quality of learning and student well being. The school's processes revolve around developing children's potential and competencies. An individualised education plan is developed for each child, based on which an assessment model is developed. These PBL schools in Bangalore and Pune aim at creating 21st-century citizens who think globally and act locally. They focus on motivating students to become lifelong learners and seek real knowledge which is experiential, through its project based learning methodology. The schools run an IB and IGCSE curriculum but also aim at developing each student's core strengths in arts, crafts, music, dance, drama and sports. Indus School is the only school that reports 'Whole Education', making it a complete school that prepares students for the VUCA (volatility, uncertainty, complexity and ambiguity) world that lies ahead of them. Podar International School is a progressive school that believes in constant pedagogical innovation. It boasts of making students inquisitive as well as moulding students as responsible world citizens. This beautifully designed school imparts information, skills and techniques with the concept of the project-based model which allows students to function effectively in this rapidly changing world. Students are either made to work in teams or as individuals; a time duration is allotted, and students are expected to explore concepts, ideas, investigate and amalgamate information to come up with their own conclusion. While working on their models, they realise the workability of a speculative idea. The National Education Excellence Award held in Mumbai 2017 was bagged by the Billabong High International School, Bhopal. The school incorporated PBL in its method of teaching believing that education cannot be provided in closed boxes and so various subjects are integrated into projects to expose students to learning surpassing the classroom. Real-time projects conducted at farms, museum and industries provide students with a more hands-on learning experience. Billabong High School prides itself on its unique technique of churning debate and creative writing into its regular curriculum. Its infrastructure is equipped with the requirements for such learning and children are usually sent home only with reference materials and worksheets. Project Based Learning Schools in India can be new and experimental for many. But for long, this method has been used at schools to make a profound impact in the way ‘real' learning happens. This approach keeps students at the centre and helps prepare them for the unknown future by turning them into critical thinkers, problem solvers, and goal oriented individuals. While parents and schools weigh-in on the Academic vs Intellectual debate, the PBL method does seem to offer something special to enable its learners to think on their feet and be soundly prepared to take on real-world challenges.